Suwaed, Muhammad. “The Image of the Bedouin in Travel Literature and Western Researchers Who Visited Palestine in the Nineteenth Century.” Digest of Middle East Studies (early view; online first). With the weakening of the Ottoman government from the end of the sixteenth century onwards, the Bedouin took over the control of the entire Country of Palestine. As the Bedouin were present across the country, western travelers and researches visiting the Holy Land as tourists, visitors, and investigators often met the Bedouin, especially during the robbery and plunder executed by the Bedouin upon travelers, and when hiring them as tour guides, renting their camels, or employing them as guards. On their return to their countries, these travelers reported on their experiences in the East in the form of books. These western travelers and researchers, in their writings, dealt with the Bedouin. They described them as providers of services to caravans, transporters of luggage, tour guides, and robbers. The writers and researchers explicitly described the traits, characters, food habits, clothing, residences, and occupations of the Bedouin. Beck, Irit. “From West Africa to Mecca and Jerusalem: The Tijāniyya on the Hajj Routes.” Journal of the Middle East and Africa 6.1 (2015): 1-15. Pilgrimage routes from West Africa provided channels for cultural and spiritual exchange between West African and Middle Eastern Muslims, and facilitated religious exchanges. Some of these exchanges were orthodox in nature; others, such as Sufi beliefs and practices, were more popular in their appeal. This article examines the ways that Tijāniyya tāriqa leaders and disciples spread their beliefs and practices along the hajj routes during the colonial period. Since this period saw the transformation of boundaries and borders, the hajj could be perceived more as a “state affair,” as its routes moved within the boundaries of the new empires or fluctuated between the new colonial empires. The article focuses on the Tijāniyya tāriqa, mainly because this tāriqa was relatively new (established around the beginning of the nineteenth century) and as such serves as a good case study for the spread of tāriqa affiliations through the hajj routes from West Africa during the colonial period. This article also examines the role of the hajj for Tijāni West African Muslims who settled in Jerusalem in the same period. Fantauzzo, Justin. “Ending Ottoman Misrule: British Soldiers, Liberal Imperialism, and the First World War in Palestine.” Journal of the Middle East and Africa 6.1 (2015): 17-32. Historians have debated whether or not the First World War in Palestine and the battle between the British-led Egyptian Expeditionary Force and the Ottoman army was considered by contemporaries as a modern, twentieth-century crusade. But did British soldiers who fought in the First World War in Palestine actually view the war as a religious crusade against the Muslim Ottoman Empire? Or did they consider it a war of liberation, conducted to free Palestine’s oppressed population from the clutches of Ottoman misrule? This article argues that British soldiers, at least retrospectively, believed that they had fought in Palestine to liberate its population and to bring forth the righteous rule of the British Empire. Wartime propaganda that painted the Turk as an enemy of civilization had a far greater effect on shaping the memory of the campaign than did any language of religious conflict. With British rule, argued ex-servicemen, came all the benefits of liberal imperialism: democracy, religious freedom, and a free-market economy. Dolbee, Samuel and Shay Hazkani. “‘Impossible is not Ottoman’: Menashe Meirovitch, ‘Isa al-‘Isa, and Imperial Citizenship in Palestine.” International Journal of Middle East Studies 47.2 (2015): 241-62. This article explores a covert partnership between a prominent Zionist agronomist, Menashe Meirovitch, and the Christian Arab editor of the newspaper Filastin, ʿIsa al-ʿIsa, a founding father of Palestinian nationalism. Under the literary guise of an Arab Muslim peasant called Abu Ibrahim, the two men produced a series of Arabic-language columns in 1911–12 that exhibited imperial citizenship par excellence, demanding political and agrarian reforms in Palestine in the name of strengthening the Ottoman Empire. The article explores their short-lived political alliance to interrogate historiographical uses of the press as a source for social history. Moreover, it challenges the portrayal of cooperation between Jews and Arabs as “collaboration” in its pejorative sense. Far from a simple story of betrayal or corruption, the partnership between the two men demonstrates how a shared commitment to Ottoman modernism brought them together more than nationalism, language, or religion pulled them apart. Nasasra, Mansour. “Ruling the Desert: Ottoman and British Policies towards the Bedouin of the Naqab and Transjordan Region, 1900–1948.” British Journal of Middle Eastern Studies 42.3 (2015): 261-83. The various policies developed by the Ottomans and British for governing the indigenous Bedouin tribes of the Negev/Naqab and Beersheba (southern Palestine) region between 1900 and 1948 are examined using primary sources. Whereas Ottoman attempts to pacify the tribes in southern Palestine and Transjordan were somewhat ineffective, the British Mandate achieved a degree of control and stability by incorporating tribesmen into the Palestine Police, strengthening the frontier areas and enhancing inter-territorial tribunal arrangements between Beersheba, Sinai and Transjordan. Foster, Zachary J. “The 1915 Locust Attack in Syria and Palestine and its Role in the Famine During the First World War.” Middle Eastern Studies 51.3 (2015): 370-94. The famine that befell Syria during the First World War was among the most tragic events in the region’s modern history. The article argues that the 1915 locust attack, which is often neglected altogether or given terse treatment as one among a laundry list of causes of the famine, was a critical factor which drove many across the region, especially in Lebanon and Palestine, to starvation beginning in late 1915. Given that the scale of the attack was far worse than anything Syria had witnessed in many decades, if not centuries; and that a huge percentage of the region’s major foodstuffs and sources of livelihood, including fruits, vegetables, legumes, fodder and a small but not insignificant amount of cereals, were devoured by the locusts, it is suggested that many of the 100,00–200,000 people that died from starvation or starvation-related diseases in the year immediately following the attack – that is, from November 1915 to November 1916 – can be attributed to the locust invasion. Safran, Yair. “Haifa al-Jadida: The Surrounding Walls and the City Quarters.” Middle Eastern Studies 51.3 (2015): 452-61. `Haifa al-Jadida` (New Haifa) was erected in 1761 by order of the Bedouin ruler Daher el-Omar, governor of the Galilee. As part of the process of building the city, a wall was constructed to encircle it, with a tower overlooking it from above. After its establishment the ‘New Haifa’ became the urban core for the emergence of modern Haifa while the new city was gradually solidified and its characteristic outlines were moulded. From the end of the Ottoman period in 1918 until 1948, the urban expanse remained practically unchanged. In 1948 ‘New Haifa’ was almost destroyed except for the few ruins that were left. In spite of the centrality of the new city in the history of Haifa, very little is known about this area. This article reconstructs the image of ‘New Haifa’ by portraying the location of the city walls and the urban expanse. For the purpose of reconstruction, an 1841 sketch of the city is superimposed on an aerial photographmap of the area taken in 2008, and a map of the old city dated to 1937. Cohen, Julia Philips. Becoming Ottomans: Sephardi Jews and Imperial Citizenship in the Modern Era. Oxford: Oxford University Press, 2014. Rubin, Avi. “Review.” AJS Review 38.2 (2014): 484-487. Kern, Karen M. “Review.” International Journal of Middle East Studies 47.1 (2015): 196-198. Reifler, David M. Days of Ticho. Empire, Mandate, Medicine, and Art in the Holy Land. Jerusalem and Springfield, NJ: Gefen, 2014. Dr. Avraham Albert Ticho was a Viennese-trained ophthalmologist who immigrated to Ottoman-ruled Jerusalem in 1912. There he married his cousin, the artist Anna Ticho, and together they made their mark on the history of the Land of Israel. 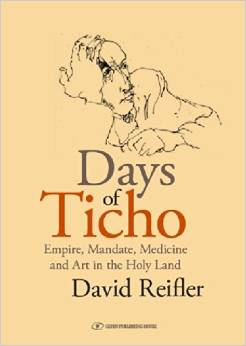 In Days of Ticho, the Tichos’ story is told in all its fascinating detail. Their personal history is presented against the backdrop of a variety of historical perspectives histories of medicine, art, civilian institutions, governments, and war; the struggles and growth of the Yishuv, the Jewish community in Palestine; and the conflicts that arose between Jews and their Arab neighbors. Among the stories in this book are Dr. Ticho’s supervision of the first Hadassah nurses in Palestine and the early years of Hadassah Hospital, as well as the near-fatal stabbing of Dr. Ticho by an Arab would-be assassin in November 1929, during the murderous riots that took place throughout Palestine. Those riots were an important turning point in Jewish-Arab relations, the harbinger of problems that remain the focus of world attention until today. The Ticho House in Jerusalem was dedicated in May 1984 as a downtown annex of the Israel Museum, and it welcomes thousands of visitors every year. This book further contributes to the Tichos’ legacy while advancing an understanding of their times and ours. Caquet, P. E. “Guizot’s Absence of a Plan for Jerusalem.” Middle Eastern Studies 51.2 (2015): 224-37. Historians have speculated over the existence of an 1841 plan by the French foreign minister François Guizot to internationalize Jerusalem as a Christian city, a plan holding major implications for the eventual emergence of a Jewish state and for European–Ottoman relations. This article aims, based on fresh archival and other sources, to provide a definitive evaluation of Guizot’s plan, its scope, and its motivations. It broadens the field to encompass other great power plans mooted in 1841, including plans of a Protestant yet Zionist flavour, and it reassesses the political weight of early nineteenth-century European religious impulses with regard to Palestine. Gribetz, Jonathan Marc. Defining Neighbors: Religion, Race, and the Early Zionist-Arab Encounter. Princeton: Princeton University Press, 2014. Halperin, Liora R. “The Battle over Jewish Students in the Christian Missionary Schools of Mandate Palestine.” Middle Eastern Studies 50.5 (2014): 737-54. Studies of Jewish students in Palestine’s Christian missionary schools largely end at the close of the Ottoman period. But although a tiny and diminishing fraction of Jewish students studied in such schools after the First World War, the mandate period was marked by anxious and often zealous Zionist anti-missionary campaigns. The article considers this space of Jewish-Christian interaction, arguing that even as a Hebrew-dominant society took root, missionary schools provided education in European languages, particularly English, tools that offered advantages to Jewish students with an interest in clerical work or foreign study. The continuing appeal and importance of foreign language skills cast doubt on the Zionist pretence of a self-sufficient Hebrew society. Kaplan, Danny. “Jewish-Arab Relations in Israeli Freemasonry: Between Civil Society and Nationalism.” Middle East Journal 68.3 (2014): 385-401. This article applies ethnographic methods and historical analysis to explore Jewish-Arab relations within Israeli Freemasonry. The article tracks local Masonic history as the fraternity developed from individual lodges under colonial-like obediences in late Ottoman and Mandate-era Palestine into a national-level organization, under the Grand Lodge of the State of Israel. In light of an official position of political noninvolvement, Jewish and Arab-Palestinian members conveyed shared values of universal fraternity, but variable interpretations of citizenship and nationalism.